The Pasha De Cartier 32MM WJ123021 is a wristwatch that exudes a riveting larger than life persona with a sophisticated chic style. The details of the watch consist of: 18K pink gold case, pink gold screw-down crown cover set with top quality diamond, sapphire crystal, sunburst frosted beige varnished dial set with 8 round-cut top quality diamonds, Arabic numerals, diamond-shaped blue steel hands, and two interchangeable straps consisting of lizard and fabric to add some versatility to your mood and/or style, and it is secured by a 18K gold double adjustable buckle. It relies on quartz moment and has a Cartier caliber of 690, and is water resistant up to 30 meters or 100 feet. 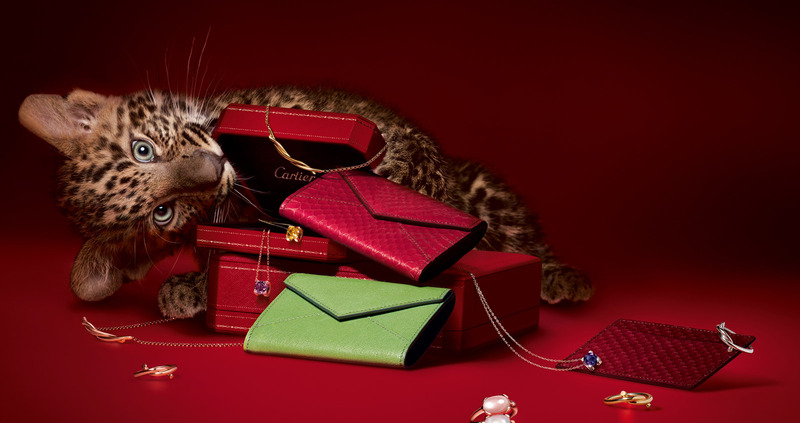 The price is $16,100 excluding sales tax on the Cartier website that will deliver it in an exclusive Cartier red box, wrapped, and sealed with the Cartier emblem. The exquisite beauty in this watch can be appreciated through the finer details such as the pointy turn on the side of the watch face that lends a classy air of sophistication while the Arabic numerals that fill up the spaces in the watch face lends an air of playfulness and personality. The diamonds on each end of the numbers add another dimension of elegant and together with the oversized Arabic numerals insist that elegance is vivacious, chic, and daring. Another fun aspect of this watch is the interchangeable lizard strap and fabric strap. 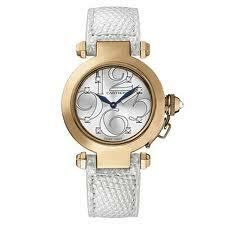 The pink gold case and lizard strap makes it a business appropriate watch for upcoming woman serious about her career, it conveys an air of sophistication and class. The fabric strap conveys an air of youthful maturity for a woman dining out with her girlfriends, on an exciting promising date, or browsing the bookstore. The Pasha De Cartier 32MM WJ123021 will complement the woman with a big personality in all areas of her life. This is a masterpiece of a watch that you are buying, a timeless art piece to add to your personal art gallery. It is an expensive watch that can be bought as a gift for that big milestone in your life such as getting the promotion you wanted, the dream job, or for graduating from Law, Pharmacy, Medical, or Grad school. It’s a big pat on the back for a job well done and nothing signifies success and big achievements like this amazing diamond studded watch. This is a big investment for those whose pockets aren’t terribly deep, so invest in it with your heart; buy it if this watch speaks to you, complements you, you can’t live without it, it completes you. And enjoy this wonderful beauty for ages to come when you do, you’re not just buying a wristwatch, you’re buying a piece of art that you can to wear everywhere with you for the rest of your life. It’s a timeless masterpiece.